“I was 17 when I got my acceptance letter to MIT,’’ says Rhoda Williams, played by Brit Marling, in the opening voice-over of “Another Earth.’’ Five minutes later, driving drunk after a party and shocked by the sight of a duplicate Earth, she slams into the car of John Burroughs, killing his wife and son. Four years later, after her release from prison, Rhoda begins working as a custodian at her old high school. She seeks out John, played by William Mapother, from “Lost,’’ to apologize. Instead, she ends up inadvertently befriending him without revealing her role in their joint tragedy. 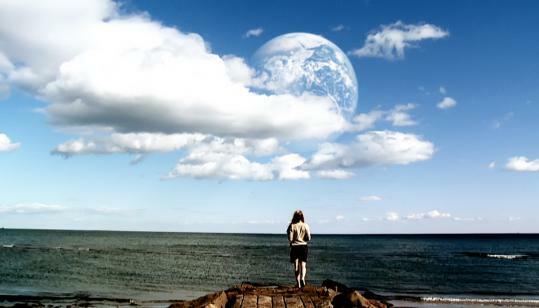 “Another Earth’’ was a surprise Sundance favorite this year, taking home the Alfred P. Sloan Prize for the best film on themes of science and technology. Fox Searchlight bought the film for over $1.5 million. It opens here Friday. An economics and studio art major at Georgetown, she took a year off after an internship at Goldman Sachs forced her to question her direction. “It became obvious to me that at 45 I would technically have done everything right but also not have lived,’’ she says on a recent visit to Boston to promote the film. So she escaped to Cuba to work on a documentary called “Boxers and Ballerinas,’’ the brainchild of Cahill, whom she had met her freshman year. Cahill was also a Georgetown economics major. He has worked as a cinematographer, producer, and editor at National Geographic, as a documentary filmmaker, and as a video artist. Something of a free spirit, he has long hair and penetrating eyes, making him look like a cleaner, more modern Jack Sparrow. His voice is mellow and sarcastic, and he grins with warmth and a hint of mischief. The actual final product cost “well under $200,000.’’ In order to obtain the shots he needed for little or no money, Cahill employed stealth tactics. Marling walked into a prison with a yoga mat pretending to be a yoga instructor so that he could shoot her walking out (after she had dumped the yoga mat) as Rhoda leaving prison. Instead of booking a train for scenes set on a commuter rail line, Cahill purchased tickets for himself, Marling, and 10 extras and they rode back and forth over the same section, while Cahill cradled a handheld camera. Cahill chose to film in his hometown, New Haven, where he could rely on the help of friends and family. A police officer he knew closed down a street so that he could film the car crash scene in the middle of the night. He used his childhood home as the setting for Rhoda’s home. His childhood room was Rhoda’s room. Like Rhoda, both Marling and Cahill have landed on a trajectory they never expected, albeit a far more pleasant one than hers. Says Cahill, “We made this film thinking we were going to show it to our 10 closest buddies.’’ Instead, they’re hurtling toward the stars. Jialu Chen can be reached at jchen@globe.com.